It’s no secret that the team at your local Quantum sail loft – sailmakers, salesmen, designers, engineers, and administrators – share your passion for sailing, cruising and racing alike. We take pride in working as a team and in the services we offer; going far beyond new sails. Sailing Hacks - The Quantum team is full of the best in the business with tips and tricks for every sailor. Many people don’t think about swinging by their local loft unless they need new sails or [gulp] they need something repaired. However, there are a vast number of services beyond setting you up with a handsome new set of sails or your annual service that you may not be taking advantage of. Quantum’s high standards don’t stop at our sails, it extends to every person that puts the green Q on their business card. Our team members are truly experts in their fields and work together everyday to help you with any need, big or small. Here are some of the ways you might not be using your local experts to meet your next challenge. Reachers, runners, Code 0s, jib tops, genoas, windseekers, and staysails—that’s just a tiny sample of the type of sails that can make up your inventory. How do you know which one to use and in what conditions? And does the sea state matter? Ask us to come out for a sail and help you build a crossover chart to get the most out of your sail inventory so you have a better chance of winning that top regatta or a successful weekend sail with the family. Don’t forget, if sails are sun rotted, or too stretched they won’t do you much good, we can also help make sure everything is in tip-top shape for when you need it. We take great pride in helping you prolong the lifespan of the sails you already own. 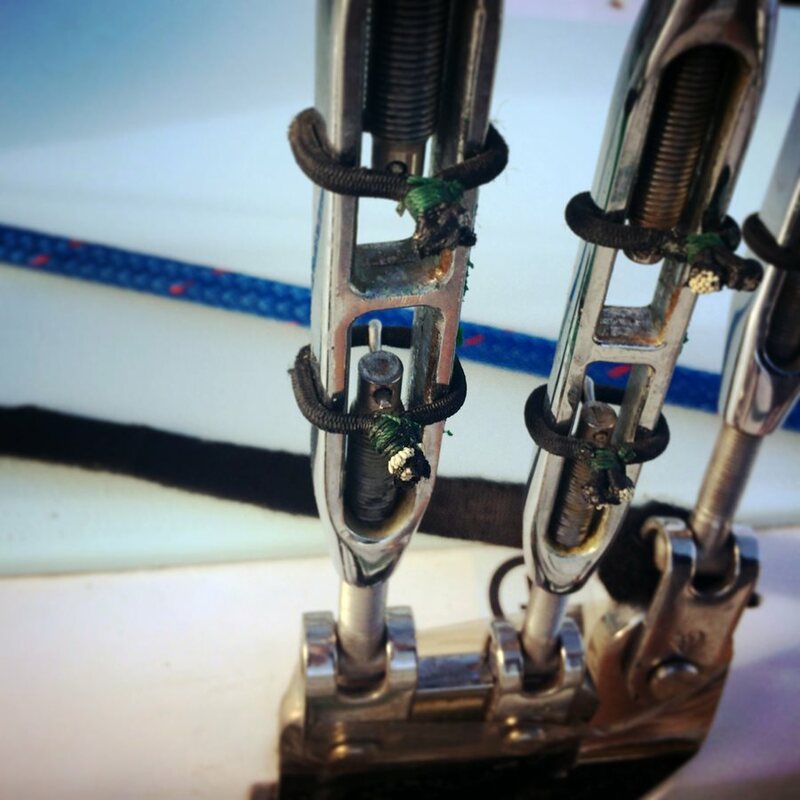 Regular sail maintenance and evaluation in the offseason that can prevent a costly sail repair later, and will help your sails last as long as possible. Additionally, before you open your checkbook for a new sail bring your sails to us to look over. There might be some adjustments or repairs we can make to buy you some more time, particularly with our Precision Recuts. Precision Recuts give new life to your sails by restoring up to about 90% of thier original shape at a fraction of the price of a new sail. Take a picture of your mainsail and genoa when it’s brand new, and hold onto that for future reference. As a sail ages, sail cloth naturally stretches making the sail deeper, which in turn makes it less efficient. It’s great if you have the budget to replace your main every few years, but it’s not always necessary. A small adjustment can make all the difference in performance. Quantum Sail Scan powered by VSPARS is a simplified version of the very powerful VSPARS real-time sail-scanning tool used on grand prix programs like Quantum Racing. Any photo uploaded to the program creates a digital version of your sail, allowing us to analyze the flying shape and determine where it may need to be recut. It’s a good idea to have the luff curve on your mainsail and genoa evaluated every three to five years. These photos can be taken to your loft for tips on adjusting your trim and rig settings to get the best flying shapes. Proper rig tuning is essential to the performance and handling of any boat. For racers and cruisers alike, a properly tuned mast will make the sails more efficient and help balance the helm. Our sail and service consultants are skilled in rig tune, and can make sure that your rig is optimized for your new or existing sails. Whether you’re looking to rearrange your control lines for ease of use, or adding a new headsail furler, we can help you determine where various control lines would best be placed on your boat for single-handed sailing, family cruising, or better crew coordination for big boat racing. Our sail consultants are avid sailors who sail on a variety of different boats at varying levels of competitive regattas, from humble beer can races to grand prix racing and from day crusing to extended offshore adventures. We’re deeply plugged into the local sailing scene and know a lot of people who want to go sailing. Need a skilled tactician or a last-minute spinnaker trimmer? Give us a call, more than likely we can help you find the right crew for your next regatta or for an adventure you're looking to take. Many of our customers are first-time boat owners. We’ll deliver your sails, and then go out sailing with you to get it set up and trimmed for performance. Or maybe you’ve got a beer can crew you want to get ready for a big weekend regatta. We’re available for on-the-water coaching to help you dial in crew work and communication. So whether you’ve got a new set of sails or need some help taking your crew to the next level, your first call should be to your local Quantum sail loft. Quantum experts are available to provide educational programs on a variety of topics. Check our event calendar for upcoming presentations in your area or reach out to your local loft to schedule a speaker for your club. Traveling to a regatta? Check the NOR and regatta schedule for any pre-regatta clinics or weather briefings. These are great opportunities to talk to the experts and learn tips and tricks from the pros. Come prepared to ask questions and take notes! If your question can't wait until the next seminar, you can always ask a Quantum expert here. Your sail repair kit should be unique to your boat and type of sailing. We’ve got a good starter list, but spend some time talking to the team at your local loft and we can line up the perfect kit for you. They can also give you tips and tricks on how to handle the most common repairs you’ll likely see during your adventures or regattas. You can also check out our photo guide to some common repairs and how to fix them. Not only are most of the members of our lofts professional sailors, they also have decades of experience sailing in their local areas. They are well versed in local knowledge – wind direction, shifts, tides, and current patterns. Our customers often call our lofts along with using a weather app (check out this piece on our favorite sources). Getting ready to start your first race or maybe you’re cruising into a new port? Call the local loft and they’ll be happy to help you sort out all the weather information you need. At the end of the day, anything you need from sails to advice, our entire staff is here to help you every step of the way – so be sure to use us. Find your local loft here. Thanks for this roundup of services! It's good to know that we have experts we can call on if we need help. Sailing out of Clayton NY one feels at times a little remote from the sailing community that one might find in larger ports.